Your photo has perfect counterpoint. Lovely. Absolutely beautiful composition, with perfect detail. Often wish I could defy gravity and soar high up in those clouds :). Existentialism! Lovely powerful and meditative photo. Bravo! Good title for the shot. Beautifully captured, gives food for thought! Beautiful! Love this in B&W. What a lovely image, I love it in the black and white too. what a dramatic picture.. the black and white colors gives it a different touch to it. black and white can be so moody! Excellent! Great capture. 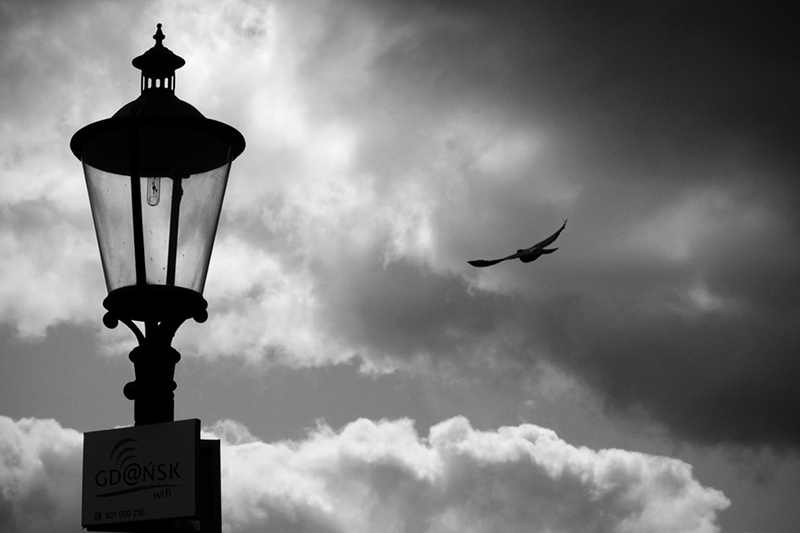 I picture the bird soaring in for a landing on the light post; having a look around and then soaring off to other destinations of adventure. Thank you for joining the Saturday Silhouettes meme.